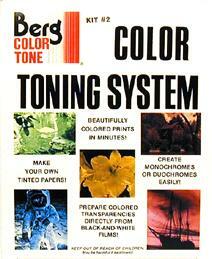 The Berg Color-Toning System is a unique toning kit for converting black-and-white prints or films to monochromes or duochromes. The process is carried out within minutes in ordinary room light with any black-and-white photographic material. Kit contains 1 qt. activator, 1 qt. clearing solution, and 1 qt. of each color provided. Colors included: Red No. 1 (2 bottles), Blue No. 1 (2 bottles), Yellow (2 bottles), Red No. 2, Blue No. 2, Green, and Violet.